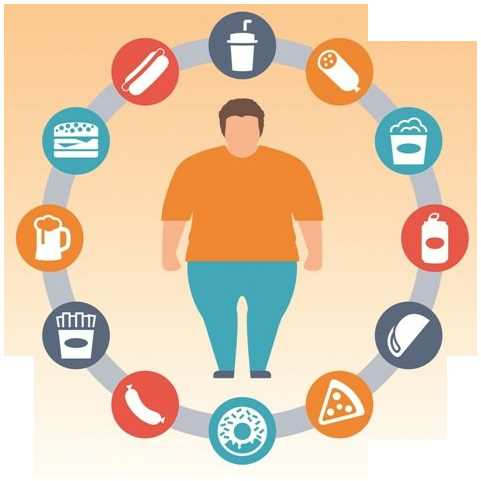 What is the reasons for obesity? 1-Nutrition: It is considered the main and direct cause of obesity. As eating large amounts of food rich in fats increases body weight to a great extent. For everybody, there is a certain number of calories that he must not exceed, If he exceeds, weight gain occurs gradually. 2-Style of life: Activities, practising exercises and sports affects a lot the body weight. The decrease in activities and motion causes an increase in weight in the long run. 4-Menopause: It causes hormonal changes that increase the hunger feeling and depression. 5-Some diseases as hypothyroidism: that decreases metabolism and so causes an increase in weight. 7-Some drugs cause an increase in weight as cortisone, antidepressants, some vitamins, antipsychotics, antihypertensives and diabetic drugs. 8-Some wrong food habits as not taking breakfast, eating heavy fatty food before sleeping and food intake as an encouragement.